The granite dinosaur casts his eye over Bodmin Moor. He has a good vantage point as he silently observes from the top of Helman Tor. The views stretch for miles. On a clear day it is said that Cornwall's south and north coastlines can be seen. As well as the dinosaur there is a giant turtle or maybe a tortoise. Okay, okay, a stretch of imagination perhaps, but there are many strange shapes created by the natural granite boulders on Helman Tor. It's fun to see where your imagination takes you. The shapes and scenery have been viewed by man since Neolithic times - some 4000 years ago. A settlement was created here and homes erected from stones and rocks. Some of the later boundary walls can still be seen - they are there to be touched. The prominence of the Tor in the landscape may have given the settlement a strategic position for ceremonial and economic functions - a place to meet, worship and trade. Over the years the granite boulders and rocks have created such strange shapes and patterns on the landscape. The weather can change quickly on the moors, as perhaps the photos illustrate - from bright blue to drab skies as the wind directions change. Logan stones are balance stones - they can sometimes be moved by hand despite their great weight. It is believed that Druids used these for their rites and rituals. Uneducated people would believe that the priests had magical powers as they moved such huge granite boulders without any effort. 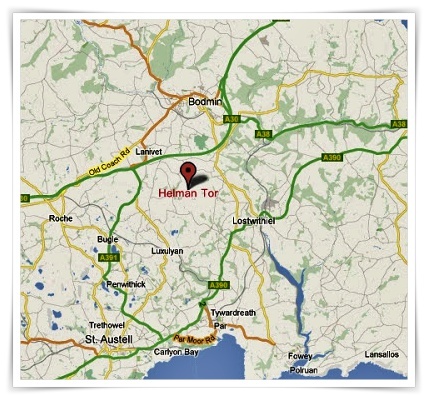 Helman Tor is away from the main Cornish tourist trail and is reached by driving or walking along very narrow roads - which are often single track. So, if driving you have to keep fingers crossed that nothing is coming in the opposite direction - as one of you will have to be good at reversing! When visiting the Tor I have rarely seen any other people. Though on one occasion I did see many wild ponies at the top - which was quite magical. I would be wandering up there on that magnificent geography and ancient land every day if I could. Spectacular views and such amazing rock formations. Thanks for such a great tour, Mike! Thanks Ann. Our most magical visit was when we saw the ponies at the top of the tor, they were all the same colour - brown and white. There must have been about 15 of them - but it must have been the only day I didn't have my camera with me! The Tors are remarkable in the way the huge rocks have weathered & how they're balanced, one on top of another. When we were in Devon & Cornwall we spent a lot of time touring around the Tors on Dartmoor, I found them more interesting than the fishing villages. Lovely post, informative as usual. Thanks David. The moors certainly have a natural beauty - as long as the weather is okay! I've lived in Cornwall since 1975, children born here and grandchildren, so it feels like home now!